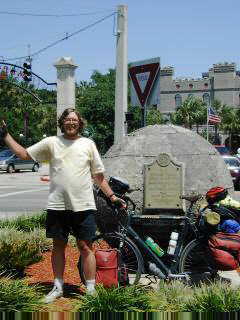 Left the gulf coast and started heading across the panhandle of Florida. Initial route passed along the Pensacola Naval Air Station. The term "Blue Angel" was also applied to other businesses, e.g. "Blue Angel bar", "Blue Angel day care", "Blue Angel mini-storage"... Cycling through Pensacola found an amazing variety in road conditions and also parts of the city. Sometimes nice wide with bike lanes, sometimes one lane, two lanes,... Came past industrial zones, harbor zones, pretty parks and along the water. Fortunately, traffic still reasonable for most of these changes. So far, Florida has better roads than LA, MS and AL. Finally, heading out of town on Scenic Drive shown above left. Some bluffs overlooking the bay. Cycled up and around the bay before going through towns of Pace and Milton. This region along a hurricane evacuation route, two lanes and pretty busy. Leaving Milton, became much quieter. This portion of US 90 follows I-10 and most all traffic must be on the interstate. An urban/rural area...saw both log trucks and also sod trucks for lawns. This route followed an active railway line with several trains passing. Each of the small towns would typically have a store, a post office, a church and not much else. Picture at left shows one of the smaller post offices at Milligan. Reached Crestview and wandered through this town, stopping briefly at local library for internet connection. 72 miles today, 2905 miles cumulative. Rode on US 90 along the panhandle through a number of small towns today. A few gently rolling hills, but mostly flat. Quiet traffic until Mossy Head where I photographed puppies at left. These guys aren't much of a menace, but have had my share of dogs along the way. Almost all stop at their property lines, though helps keep adrenaline going. Another stop fifteen miles later in DeFuniak Springs. Took a short detour to circle Lake DeFuniak. Several historic houses and also the church above left. Church chimes ringing for quite a while. A woman was busy hiding easter eggs in the park. Four miles further at Argyle, US 90 lost shoulders and went through eight miles of road construction. Fortunately, still light traffic. At end of the construction, was stopped briefly by the flagman. Where you coming from? San Jose? Wow! I told him I hoped the construction would include shoulders. Continued through small towns of Ponce De Leon, Westville, Caryville to Bonifay for lunch. This town had a tornado several months ago, but still talking about it in the paper. Stopped briefly at roadside business at left. Started as a bait shop, but now also included produce. Chipley is a railroad town, named after William Dudley Chipley, builder of the Pensacola & Atlantic railway. Now also an Amtrak stop. Shoulders disappeared again for the last 19 miles in to Marianna. 85 miles today, 2990 miles cumulative. Today the theme was "riding to Tallahassee". Each of the road signs for the past 100 miles has listed the next town as well as Tallahassee. Followed US90 from Marianna to Grand Ridge across a few gentle hills and mostly quiet traffic. This region farming and ranching country, but also some woods. Saw tomato plants, cabbage and others I couldn't identify. Truck stop at Grand Ridge...on the way to Two Egg, Florida. Two lanes wide most of the way into Sneads and then across the Apalachicola to Chattahoochee. A several prisons around Chattahoochee. Also signs above right where prisoners trimming undergrowth on the shoulders and picking up trash. I've seen quite a few more Florida prisoners on sides of the highways than other states. Frequently clothed in bright orange pants or striped white/black pants. The Apalachicola marks boundary to the Eastern Time Zone. No more left. Nice view to a dam and Lake Seminole behind, though also quite a bit of glass in this area. Nice Main Street in Chattahoochee and then quieter country through Mount Pleasant and Gretna. At Gretna, the store clerk warned me about hills ahead. This is Florida, how many hills can there be? Well, definitely some rolling terrain in next 28 miles getting to Tallahassee. Never enough to get into granny gear, but surprisingly much for Florida. Took a smaller backroad, FL 268, to Quincy and then US 90 again past Midway and the big city. Along the way, passed a "Church of the Holy Temple". More than thirty chairs out, along with a sign about estimated time of arrival, July 8, 2001. This latter one with an asterisks, though no definition of the asterisks anywhere. Lots of traffic the last bit and thus time to stop and tackle middle of the city on a hopefully quieter Saturday morning. 65 miles today, 3055 miles cumulative. I'm glad I waited until Saturday morning to ride through rest of Tallahassee. Several rolling hills as passed FSU and then the capital. After US 319, about a mile of road construction before the route became one lane each way without shoulders. Surprising how much rolling hills in this first stretch. Still mild compared to Texas, but for Florida some hills. After crossing I-10, the route became quiet again. Mostly wooded, some country houses and also a nursery along the way. Peaceful riding, but still happy to see the Hilltop convenience store close to US 59. I switch colors in diluting Gatorade in one of my water bottles, though red seems to be a more persistent color than green. Crossed past Lake Miccosukee shown above right and then into Monticello. This town had a courthouse right in middle of US19/US90 intersection. Road quickly became quieter as headed through Greenville to Madison. Madison looked like a cute small town to stay, but motels at the I-10 interchange 4 miles away. Next to the courthouse was a somewhat strange looking large silo for water or something. No description of it though. From Madison, came across more woods including the Suwannee River and a vacated agricultural inspection station. Crossed I-10 one last time and stopped in Live Oak. 89 miles today, 3144 miles cumulative. Easy Easter ride today, with services, prisons and history. Foggy overcast morning starting out. Local Baptist Church had 120+ chairs out for a sunrise service, but looks like services were indoors. Lots of places closed, though the Walmart 24 hour Supercenter had oranges and other breakfast foods. Quiet and rural riding again through Houston and Wellborn and then busier into Lake City. Easter displays out including the bunny at left. Just past Lake City, met up with Ian and Jen, pictured above right and with their web site here. They were five days into a trip across the USA to San Francisco. Traded info about the road and also lent them my last two Adventure Cycling maps as I had left that route behind in Wellborn. Prisons and forests in this area. Several interpretive displays about the DeSoto journeys of exploration and conquest of Florida and also some road signs commemorating "Walkin Lawton Chiles", the late governor and senator from the state who must have walked across the state while campaigning. Four or five different prisons. Clerk at Olustee explained this used to be a poor area and hence site for prisons. "Most everyone is armed in this area anyways...". Stopped briefly at the Olustee Battlefield with some nice exhibits about the largest civil war battle in Florida. Slightly busier riding with a light tailwind coming into Macclenny. Still early, but nice place to stop. 58 miles today, 3202 miles cumulative. Made it to Saint Augustine today. First morning with clear skies and cooler temperatures in at least two weeks. Rode along surprisingly busy county roads past Maxville, Middleburg and Penney Farms. Came past a large lumber yard. Logs below left and finished lumber shown below right. Flat terrain and NW tailwinds to keep my travel quick. Clay County has some of the least polite drivers I've seen. Several occasions, someone yelled "get off the road!" Not that there was much alternative without the shoulders. In contrast, clerks at stores were among the most friendly to cyclists. Warm up ride complete. Made it across the USA. 66 miles today, 3268 miles cumulative. Three days playing tourist in Saint Augustine. The city is the oldest continuously occupied city in North America...dating back to 1565 when Pedro Menendez landed with 700 Spanish soldiers and colonists. St. Augustine became British in 1763 in trade for Havanna at end of the 7-years war. Another brief Spanish period started in 1783 at end of American Revolution. Spain ceded Florida to the US in 1821 and it became a state in 1845. Castillo De San Marcos, old Spanish fort in center of town. Rating=4. Fort made of Coquina, a shell mixture. I was intrigued to see old furnace where cannonballs were heated before firing so as to cause wooden ships to burn. Mostly closed due to restoration but central to story of the town. Alligator farm. Rating=5. There are 23 species of crocodilians in the world, the farm has a complete set, including several albino alligators. Also a smaller collection of monkeys and nesting birds (alligators below keep predators at bay). Lightner Museum. Rating=4. Three story collection of different memorabilia from around the world. For example, while I was there, I heard a demonstration of music boxes. The Lightner museum is housed in buildings originally built by Henry Flagler as tourist hotels. Spanish Quarter. Rating=3. Reenactment of the Spanish period around 1740, includes people in period costume. Small blacksmith shop, woodworker shop, several houses, etc. St Photios National Greek Orthodox Shrine. Rating=4. Displays providing a clear story of how Greek immigrants were brought to a colony of New Smyrna, Florida and then many of them ended up in Saint Augustine. Also the Greek Orthodox Shrine. Fountain of Youth. Rating=4. Park commemorating the landing of Ponce de Leon in Florida in 1513, and subsequent claim of North America (Florida) for Spain. Drank from sulpher-tasting fountain of youth, saw the planetarium show, walked around the grounds and saw a large "discovery globe" exhibit. Museum of weapons. Ratings=4. Small with an old collection of guns on the wall are ok. Even more interesting, I found the collection of civil war documents, money and other memorabilia. For example, some of the old succession documents. Old Jail Museum. Rating=2. Small jail from 1890s including rooms for the warden's house and small cells. Fine as jails go, but otherwise not much to see. Heritage Museum. Rating=2. Small collection of exhibits of Florida history. Ok overview, but nothing special. Lightner Museum definitely a better place to see. Wax Museum. Rating=1. Wax people and hokey visitor film. Skip it. Walking tours. Rating=5. Bought a book containing five walking tours. I walked through all of them and peered into different places. Despite the long list, I did skip a few more tourist places: Ripley Believe-it-or-not Museum, Oldest School and Oldest Store museums. 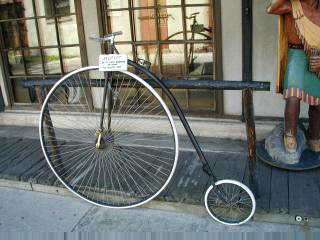 If someone is visiting Saint Augustine, it would probably take at least two days to see the most interesting stuff. While I was in Saint Augustine, the Space Shuttle took off, saw it briefly in the sky. Also went to a talk about Florida politics by editor of the Miami Herald. Also more mundane visits like Barnes & Noble, Library, etc. Fun little town to visit. Felt good to be on the road again after three days of playing tourist and walking around town. Cycled across the Intercoastal waterway and headed north along the beach. The route was mostly behind the first row of dunes. As seen above left, a row of beach houses sat atop the dunes. Later the route also went inland past country club like terrain. In this area, seems like people generally had lawn service rather than doing yard work themselves. Flat travel with varying shoulders. Less out of the towns and as I passed through Guana River State Park. Came north through Ponte Vedra Beach and into Duval County. Here I stopped for a mixed breakfast, laundry and relax break. Surprised to have a teenage girl ask me to buy cigarettes for her (no thanks!) There was a bike store here, but personnel weren't too helpful about routes into the city. I had remembered a AAA from my Atlantic coast ride in 1995. However, it seems this time I bypassed it by riding along FL203 instead of A1A. Not to worry, the Yellow Pages listed another at 3740 Beach Boulevard. Beach Boulevard is also US 90. After all the time spent on that route, I thought it was fitting to ride into town on US 90, though odd since this would be the only stretch I rode westbound. Street addresses quickly increasing...until I crossed, the intercoastal and entered Jacksonville proper. Now they started at 15000 and counted down. This next stretch had some "strip" development and alternated between nice bike lane and not much shoulder. Moderate traffic as I rode towards town. The AAA office was within a few miles of center of town. Got maps and directions and found a good motel almost downtown. Walked around downtown including visiting the Maritime Museum. Friendly folks and large model of USS Saratoga. The sixth Saratoga was an aircraft carrier (CV-60) with home port Jacksonville. She was commissioned in 1957 and decommissioned in 1994. However, is now in Rhode Island since it would cost too much to build a permanent hurricane-proof permanent mooring. Nice downtown along the St. Johns River. 39 miles today, 3307 miles cumulative.